Well over 600 people, including 360 school pupils and Church Lads’ and Church Girls’ Brigade (CLCGB) members, learned all about the life of St Patrick at Patrick’s Mysterious Adventures in Christ Church, Lisburn, Diocese of Connor. 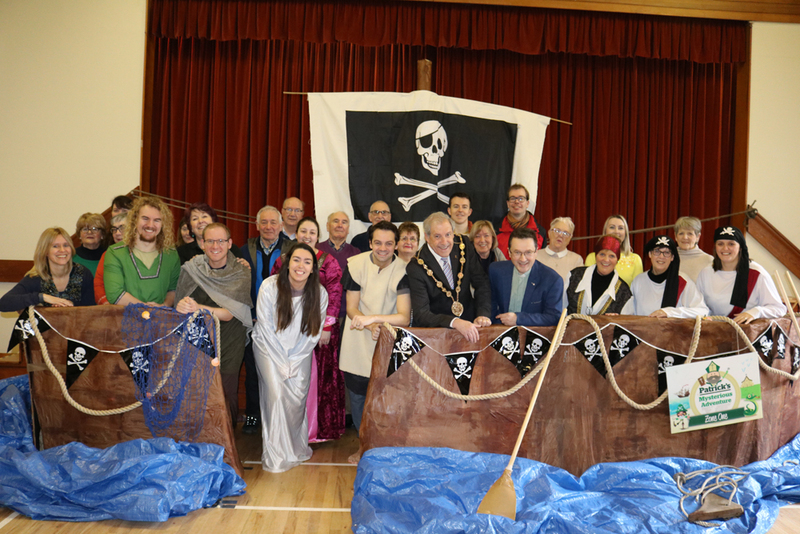 Lord Mayor of Lisburn and Castlereagh, Councillor Uel Mackin, jumped aboard with the team of Patrick’s Mysterious Adventure on opening day at Christ Church, Lisburn. 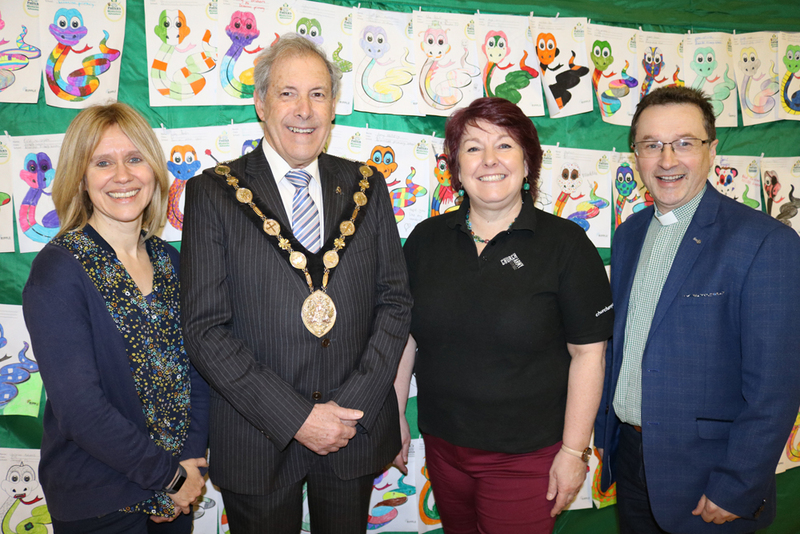 The interactive exhibition and story trail opened at Christ Church Parish, Lisburn on 13th March. It ran until Saturday 16th March 2019 with a special St Patrick’s themed service on March 17th at 11:30am. Pupils and teaching staff from seven primary schools jumped on board during the first three days. There was also an evening for youth organisations, and around 250 people attended on the public day on Saturday 16th March. On the Wednesday, Thursday and Friday, the school groups visited seven different zones each depicting a different stage of Patrick’s life. They also took part in a history workshop led by Spencer Cusack from the Saint Patrick Centre in Downpatrick, and an art workshop. Participating schools were Old Warren, Brownlee, Central, Tonagh, Knockmore and Wallace Prep. Two schools who had participated last year – Broughshane Primary and St Patrick’s, Loughguile – enjoyed that experience so much they came back for more this year! For the first time the event also featured an evening for youth organisations. Victoria Jackson, a member of Connor Children’s Council, is Development Officer for CLCGB and she organised for some of the local brigades to come along on the Thursday evening. As well as the Christ Church brigade, other brigades who attended were St Michael’s, Shankill Road; Lambeg; St Hilda’s, Seymour Hill; and St Matthew’s, Broomhedge. On Saturday March 16th the event was open to the public, with four timed performances of the Story Trail throughout the day. There was also a café, craft workshops from Jumping Clay and Julia’s Ceramics, a reptile exhibition from Talking Reptiles and Irish dancing. On Sunday March 17th there was a special St Patrick themed service in Christ Church. Ross Jonas and Chris Neilands from the Play It By Ear Theatre Company, who led the drama all week, performed again in the service. Sister Karen Webb spoke about St Patrick’s faith and character. Lord Mayor of Lisburn and Castlereagh, Councillor Uel Mackin and the Ven Paul Dundas, rector of Christ Church, Lisburn with event organisers Jill Hamilton, left, and Karen Webb. The event was organised by Connor Children’s Council. Jill Hamilton, Connor Children’s Project Development Officer, and Karen Webb, North Belfast Centre of Mission, said it had been a great success. “It was a privilege to bring Patrick’s Mysterious Adventure to Christ Church in Lisburn and to work in close partnership with the clergy and parishioners,” they said. “We loved sharing the story of Patrick in such a creative and enjoyable way and we were delighted that so many local schools and members of the community participated in the event. This article was submitted by Karen Bushby, Connor Diocesan Communications Officer. Read more news from the Diocese of Connor on their website here.